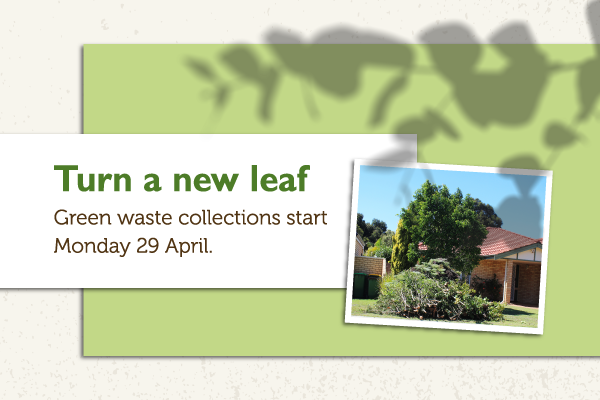 Area A (Fremantle, North Fremantle, O’Connor and White Gum Valley) will be collected from Monday 29 April. Area B (Beaconsfield, Hilton, Samson and South Fremantle) will be collected from Monday 6 May. Please keep your neighbourhood tidy and help reduce illegal dumping by ensuring that material is not placed on the verge more than two days before the collection date. A maximum of two trailer loads or two cubic metres of green waste will be collected from each property, including tree trunks, branches and prunings up to 1.5 metres in length and 30 centimetres in diameter. General rubbish, bags and boxes of leaves or grass clippings, dug out lawn, weeds and roots, or sand and soil won’t be collected. Green waste can be placed on the verge up to two days before the collection date. Residents are asked to place their waste on the verge as neatly as possible, away from walls, fences, power poles and trees and ensuring it doesn’t obstruct footpaths, driveways and sprinklers. If you miss the verge collection, clean green waste can be dropped off all year round at the City of Fremantle Recycling Centre on Montreal Street. All of the green waste collected will be processed into mulch, which can be collected from the Recycling Centre by Fremantle residents to put back on their gardens. Visit the residential bulk green waste page.